PLEASE NOTE: There is now a newer version of this binocular, take a look at my full Minox BL 8x33 HD Binocular Review for full details. I must confess that I was really looking forward to reviewing the Minox BL 8x33. This was because I had a brief look at the new version on the Minox stand at the recent British Bird Fair in August and my first impressions of them were really good and so eagerly awaited for the sample to arrive in the post. One of the main reasons I looked forward to testing the BL 8x33 Minox binoculars is because they are the exact type of binocular that I use most often. The 8x magnification means that in theory they should be great as birdwatching binoculars and good for wildlife observation and as general use optics. The mid-size and fairly compact body with their 33mm objective lenses mean that they are much easier to travel with as well as easier to carry in the field than a full size 8x42 binocular. So for me they immediately stand out as potentially an ideal binocular for taking with you almost anywhere, be that on that once in a life time safari, a birding holiday, to a sporting event or just for a walk in the countryside. Other uses like hunting or taking to sporting events where once again a more compact binocular with a wide field of view is important. In many ways a Mid-Size binocular like these with 33mm objective lenses are the ideal compromise between light gathering potential and size. Small enough to easily carry around and fit in with your hand luggage if you are going traveling like on safari, yet they still have large enough objective lenses to gather enough light to work in poorer light conditions. Like what you get in the early mornings and late afternoons when many birds and other wildlife is most active. All 8x33 binoculars, including these Minox BL's have an Exit Pupil of 4.1mm and a Twilight Factor of 16.2, both of which suggest that whilst they may not be the best binoculars in the world for poor light conditions, they are also far from the worst, which is what you would expect on a mid-size pair of optics. It is important to remember that whilst all 8x33 binoculars will have the same exit pupil and twilight factor, this does not take into account the quality of the prisms, lenses and their coatings. Binoculars with better quality prisms, lenses and coatings will far outperform binoculars that have the same configuration, but with cheaper optical components. The "norm" for mid-size binoculars is to use 32mm objective lenses and it is interesting that Minox have chosen to use ever so slightly larger 33mm ones on these BL binoculars. If we compare the numbers, a 8x32 binocular will have an exit pupil of 4mm and a twilight factor of 16, so if all other factors are equal the Minox 8x33 will very slightly outperform them in terms of image brightness. The down side is that these binoculars should be slightly larger and possibly heavier than most binoculars with smaller objectives lenses, but like the difference in brightness, it is hardly noticeable. Whilst the manufacturers have many instruments to tell them just how well their lenses, prisms and coatings perform, it is how they perform in the real world with "real" eyes that is important to you and me. As with every binocular review that I have done, I compared the view through these with my "benchmark" 10x26 compact and 10x42 full size binoculars. I don't reveal what binoculars I use as the benchmark as I feel that that is not important or fair to the manufacturers, but both are what I would call good quality middle of the range binoculars and are the same pairs that I use for all my reviews. It is in this way that I can make an informed opinion of the brightness, clarity and sharpness of the imaged produced. The image of the Minox was far brighter than that of the benchmark 10x26 compacts and even matched the benchmark 10x42's during the day. Testing them in the poorer light conditions at sunrise, the difference was much more noticeable and the Minox easily outperformed both of my benchmarks. Overall I was extremely impressed with the view through these Minox BL Binoculars, the image was very bright and sharp. What is more is the amount of colour fringing and softening of the image on the edge of the image was minimal and far less than that you often find in poorer quality binoculars. Very Impressive. The angle of view of the Minox 8x33 BL Binocular is an excellent 8.0° or in other words the field of view is 421 ft at 1,000 yds or 140 m at 1,000m which is very good. It is the same as the top of the range Swarovski 8x32 EL's and easily makes it onto my list of wide angle binoculars. A wide field of view makes easier to spot any object, but especially fast moving ones like birds and is why it is a feature that most people look for in a good pair of birdwatching binoculars. It is also useful for spotting any wildlife and most sporting events because you get more of the action in view without having to move the binocular about. I personally love the open bridge design that is becoming more and more popular these days. Not only are they comfortable to hold up to your face but your grip on them, even with one hand is that much more secure. This is really important when for example you are walking through dense vegetation the chances of them being knocked out of your hand is greatly reduced. Like most people, what I want is a compact, lightweight binocular that are easy to carry everywhere and that produces brilliant quality and bright images. But as with many things in life, including binoculars there are compromises. To make small binoculars, you need to have small objective lenses. Smaller objective lenses have less light gathering potential than larger ones and so the smaller you go, the image produced gets duller and is therefore less suitable for poor light conditions like the early mornings, late afternoons and evenings, when most wildlife is most active. Mid-Sized binoculars with objective lenses around 32mm or 33mm like these Minox BL's are for me the ideal compromise for a good all-round binocular. The still have plenty of the light gathering potential of full sized 42mm binoculars, yet are not that much bigger and heavier than true compacts. 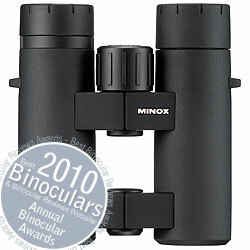 Even though theses have very slightly larger objective lenses than most mid-size roof prism binoculars that I have reviewed, the dimensions (138x130x45mm/5.4x5.1x1.8in) of the Minox 8x33 binocular compares very well with most others. For comparison, the very top of the range Swarovski 10x32 EL Binoculars have dimensions of (137x114x61mm/5.4x4.5x2.4in). The L in the product name stands for Light and they are fairly lightweight although at 22.93oz (650g), they are not the lightest pair of mid-sized binoculars that I have reviewed. For comparison the top of the range Swarovski 10x32 EL Binoculars that weigh 21.5oz (610g). I love the feel of the armor that covers the Minox BL 8x33 Binoculars which have a number of benefits that include giving you a comfortable and secure gripping surface even when wet and it dampens down any noise from that you would get from accidentally bumping them that could frighten away skittish birds and other wildlife. This may not seem important, but is something that I often do with my wedding ring! It also obviously helps protect the binocular from the bumps and scratches that come with day-to-day use. As with all Minox BL binoculars, the 8x33's feature a "specially developed sealing technology" that I have not been able to find out more about, but the do mean that these are fully waterproof to a depth of up to five meters. They have also been "nitrogen purged", which means that the air inside the binocular has been replaced with nitrogen gas, this prevents the interior optical surfaces from fogging up due to rapid temperature changes or in areas that have high humidity. The large central focus knob was smooth on the pair I tested. Focusing from near to far was quick as the aggressive gearing in the focusing mechanism means that it takes just one and a half turns to go from near focus which is an excellent 8.2 ft / 2.5 m to infinity. Fine focusing was also no problem. The diopter adjustment is located on the right eyepiece and is used to correctly set up the binoculars for your own eyesight by adjusting for differences in your eyes.It was very tight on the model I reviewed and will definitely not be moved by accident, which for me is a good point. For something so simple, the eye cups can either make or break a pair of binoculars as this is the point of contact between you and your optics. The twist out "multi-position" hard rubber ones on the Minox are good, have a quality look to them and are comfortable against your face. They can be fully extended for non-eyeglass wearers, or for those that wear glasses, fully retracted. There is an excellent 17.5mm of eye relief which easily makes it into the category of a long eye relief binocular and they also have two click stops in-between the extremes should 17.5mm be too much eye relief. 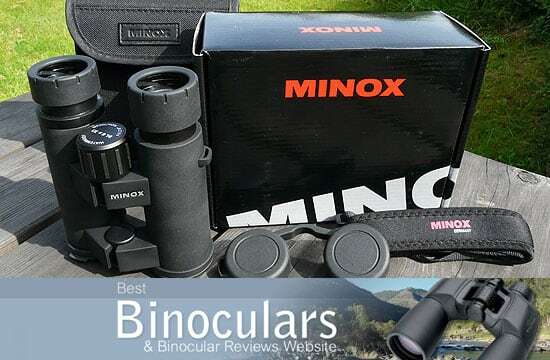 This 8x33 Minox has fully Multi-coated Lenses which is what you want on you binoculars because this means that ALL the air to glass surfaces on the lenses and prisms are multilayer-coated with anti-reflective coatings. What this does is help increase light transmission across the entire field of view. Bak-4 roof prisms are used meaning they are made of superior optical glass that produces clearer images. As well as this the prisms also have a Phase-correction coating that help to reduce the phase shift of light caused by phase differences arising from total light reflection on a roof surface! Sounds complicated, but basically it keeps the light in correct color phase and has the result of reducing the loss of image resolution to maintain high-contrast images. It is a feature that is only found on high end roof prism binoculars. So as you can see in terms of the stats, these binoculars are very evenly matched, apart from the price. The EDG has more eye relief, the Swarovski's and the Minox's have very slightly wider field of views. The fact that the 8x33 BL is priced in the "High Quality" bracket between $300 - $500 (�300 - �500) but way below the very top of the range binoculars like the Nikon 8x32 EDG and Swarovski 10x32 EL's mean that for me they may excellent value for money. Think of it this way, the Nikon EDG's are about double the cost of these, whilst the Swarovski's are almost 4x the cost. But are they 2x or 4x better? No way! Don't get me wrong the Nikon and Swarovski's are excellent binoculars, the very best in fact and do have some quality features that are expensive to manufacture that the Minox BL's don't, for example ED glass (Extra-low dispersion. ), hence the price difference. So they do edge these and pretty much ever other binocular on the market and if you can afford the very best, you should. But if the very top end is out of your league then you will not be disappointed with these. The quality of the soft carry case is good, although I prefer harder ones with a semi solid construction that offer just that little bit more protection. The quality and feel of the neck strap is good and they make wearing the binoculars around the neck comfortable. Also included in the box was a micro fibre lens cleaning cloth. In the Minox BL 8x33, you have a binocular with very high spec quality optics that produce an excellent quality image that is really bright for a mid-sized binocular. This combined with the very comfortable, robust and good looking body that is well balanced makes them one of the best mid-sized binoculars that I have ever reviewed. Personally I would love it if Minox made a 10x version, but even so I would be more than happy to own a pair as these make excellent safari binoculars, great birdwatching binoculars, ideal compact hunting binoculars, will work well at most sporting events where a wide field of view is important and because of their mid size won't be too much of a pain to carry around on that lazy weekend walk in the countryside. Ideal compact and light birding binoculars these come with Nikon's incredible ED glass lenses, advanced multilayer coating.